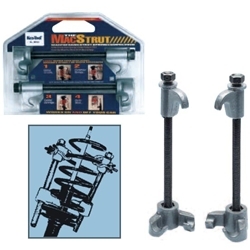 MacPherson Strut Coil Spring Compressor Set Ken Tool 39730 / BOWES KT 39730. Compressor works on most MacPherson Strut assemblies and is for use with replacements. Use the compressor when replacing bent strut or strut tube and damaged spindles. Use it on or off the car. Acme threaded screw for durability. Do not use on General Motors “A”, “C”, “J”, or “X” body cars.